Inside scoop: Wendy tried it and loved it! Cryotherapy is the process of subjecting the body to extreme cold for a short period to take advantage of a health response naturally triggered by freezing temperatures. 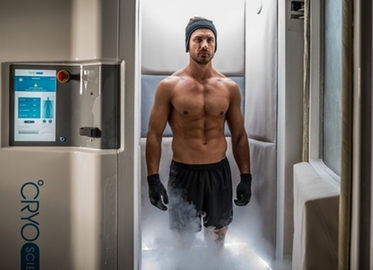 (If you are curious about the “why” of cryotherapy, check out the numerous articles explaining the body’s metabolic response to cold.) This response is dramatic which is why professional athletes swear by cryotherapy and use it frequently. And it is also why cryotherapy is going mainstream; not only does it quicken athletic recovery, but it helps with general pain relief, and has anti-aging and beauty benefits. Anecdotal evidence also suggests that cryotherapy improves sleep, increases energy, and even promotes clearer thinking. Synergy provides socks, gloves, and ear warmers, and an experienced technician stays with you the entire time! We froze Synergy’s retail prices for today’s deal: get one session for $26 (regularly $65) or a series of three sessions for $69 (regularly $150). For best results, three consecutive sessions are recommended. P.S. If you have any questions about my experience, please feel free to email me at Wendy@conejodeals.com.